Georgetown was founded in 1849 during the Gold Rush and was the hub of a fantastically rich gold mining area. Antique hunting along the historic main street, exploring the gold mining territory, see an actual stamp mill or visit the Old Pino Grande railroad (narrow gauge) lines are a few popular things to do in the area. 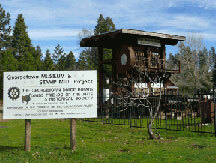 Located 15 miles north of Placerville on scenic Highway 193 or 10 miles north-east of Lotus on Marshall Road.